'Realms of the Unreal': Henry Darger's Secret Life For much of his life, artist and recluse Henry Darger was almost invisible. But in death, Darger has become well known and honored, inspiring books, a musical and now, Realms of the Unreal, a documentary by Filmmaker Jessica Yu. 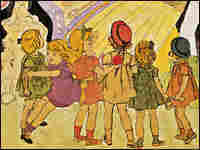 For much of his life, Henry Darger was almost invisible. He was an odd man -- a reclusive janitor whose outside life revolved around going to church and monitoring the weather. But in death, Darger has become well known and honored, inspiring books, a musical and now, a documentary. A talented and troubled artist, Darger used large paintings and a 15,000 page epic novel titled The Realms of the Unreal to create a secret mystical world of heroic little girls fighting evil. Filmmaker Jessica Yu's new film about Darger has the same name. She talks with NPR's Jennifer Ludden about the documentary.